- Be liberal with these ingredients. - Let marinate for at least a few hours. 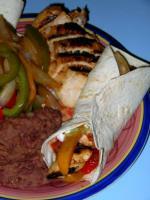 - Slice chicken into fajita size pieces and grill to perfection. - Serve up with some warm tortillas, fresh guac, sour cream, tomatos, salsa and whatever else you like. Enjoy this dish with a cold beer or a chardonnay while listening to the beach boys or any other summertime music. Enjoy!